Eco Diesel Solutions offers solar mounting solutions from DPW, Wattsun, Sun Top and Kinetik. Eco Diesel Solutions also now offers our newly designed and in house built Eco Solar Ribs and Eco Solar Multi Pole solar racking system. 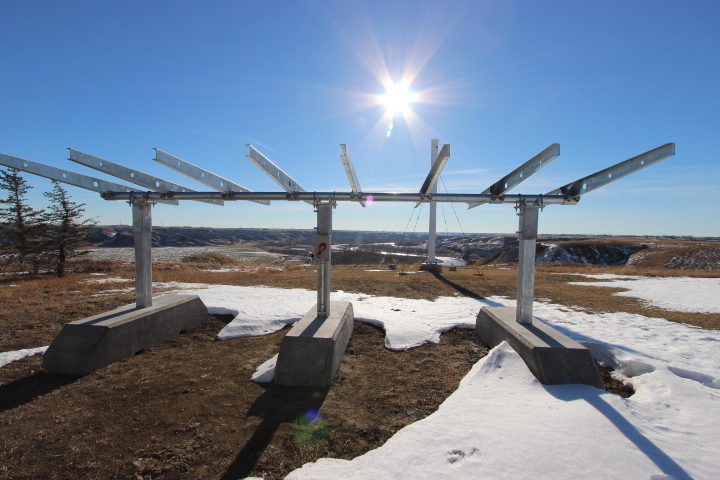 The Eco Solar Rib heavy duty, season adjustable multi pole solar racking system was specifically designed for our extreme high wind location here in southern Alberta. 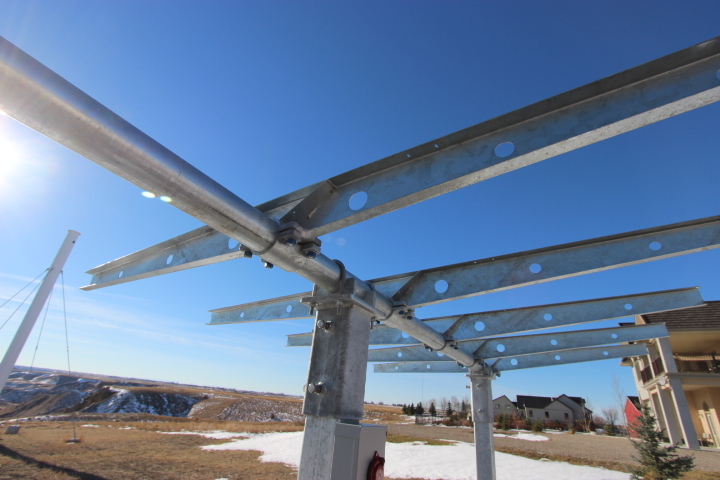 (where we frequently see 78mph + winds) The Eco Solar Rib and multi pole racking system was not just designed for our own site, but was also built with our customers in mind for several reasons. Over the last 4 years we often found we were waiting 5 - 12 weeks for other ground mounts to be built and delivered by our distributors. Another reason for the development of our own ground mount racking system was because the majority of our customers are handy do it your self people that choose or want to build or set up at least part of their own solar racking. 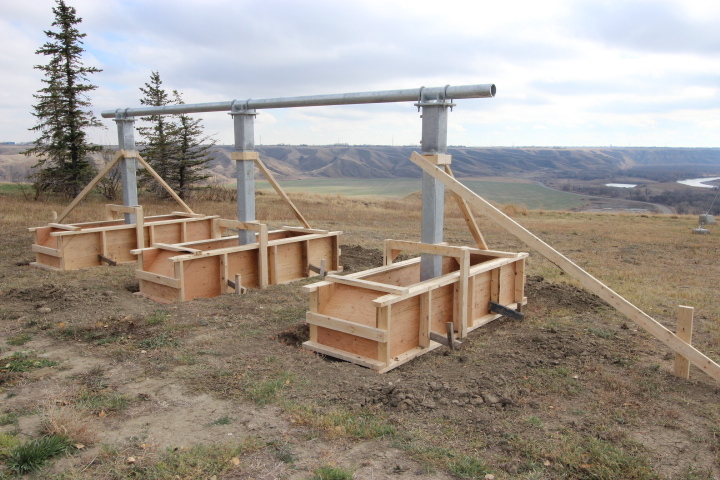 The third reason was because the multi pole mount racking systems we were purchasing for our customers were not complete systems and do not include the galvanized standing pipe/masts or the cross tube. Lastly although the solar rackings from our suppliers are nicely made and engineered they are not as strongly built as I would like to see them for the conditions we see here in Alberta. 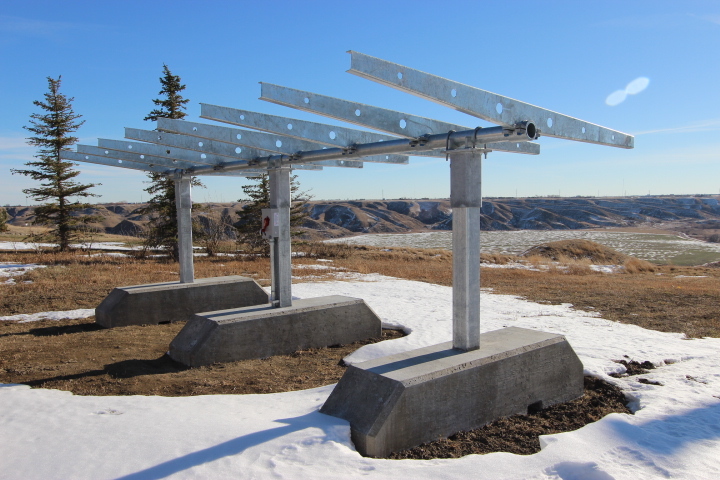 If a customer desires a complete ground mount racking system then, Eco Diesel Solutions can provide everything required to set up their REC solar array (including rental of our base block concrete forms). Secondly we will also offer our Eco Solar Ribs for sale as a component that would allow a customer to easily mount our high quality REC solar modules onto his own fabricated T post (4.5" OD cross tube ). Using a quantity of 2 of the Eco Solar Ribs will mount a quantity of 3 - REC 230, 235, 240 or 250 watt solar modules stacked in landscape. With a quantity of 4 ribs you will mount 6 modules on a single 6" x 6" x 1/4 wall x 13ft L vertical post. If using 6 Eco Solar Ribs you can mount 9 of the REC 235 watt modules onto 2 - 6" x 6" x 1/4" wall x 7'L vertical posts for the base block style mount or 13ft L posts for cementing into bored holes. As you can see in the pictures of our own Multi Pole set up uses 3 posts, 8 ribs and will mount 12 of the REC 235 watt modules for a fairly impressive 2820 watt solar array in an open extremely high wind area. 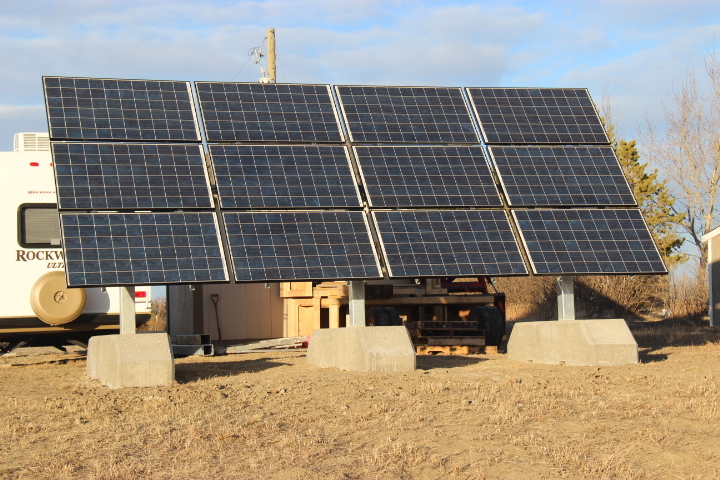 Using our base block multi pole design allows for quick set up but also means the solar array could also be disassembled and moved at a later date if required. Likewise a person could cast 2 base blocks and mount up to 6 Eco Solar Ribs for a very sturdy 9 module REC solar array without augering holes. We will be fabricating more of our Eco Solar Ribs in spring for our stock, but am now taking orders for complete multi pole racking systems for the summer of 2013. If you are looking for or are considering a heavy duty solar racking system for your property and would like to view our Eco Solar Multi Pole racking system please feel free to call or email to arrange a time for a little tour. For more information on any of the fine products we carry please contact Troy at Eco Diesel Solutions Canada. We look forward to hearing from you.